Last time, I introduced the subject of Disturbance in bowling green ecology and maintenance. I finished by posing the question; How can we use disturbance theory to our advantage in our quest to create a Performance Bowling Green? To answer that, let’s look at what might constitute Disturbance in the average bowling green. As greenkeepers we actually have an impressive amount of potential influence we can bring to bear on the turf environment; some good and some bad. We can think of these influences as pressures and by applying them with the right force we can manipulate the bowling green eco system (to some degree) to our advantage. Last time we also discussed Stress factors, which when compared with physical disturbance from our machinery and bowling, can seem innocuous, but the overall affect of say LDP can easily be more damaging to our turf in the long term than an obvious physical disturbance like hollow tining. Every day Greenkeeping and bowling can have a high disturbance value and put the very grass we are tending under a lot of stress. 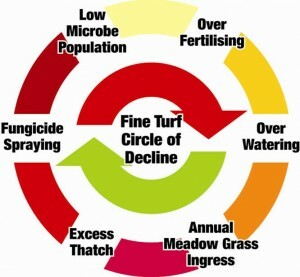 Mowing, verti-cutting, wear from bowling, pests, diseases, disorders, aeration, top dressing, water and nutrient availability and soil pH can all cause stress to a greater or lesser degree and this will change depending on grass species, general green condition, weather and soil type/condition. Well the answer is clear then isn’t it? Maybe if we just do nothing (which is the right thing sometimes) the green will improve on its own. If we had unlimited time and didn’t need the green to be prepared for bowling, then I would say absolutely yes, leave it alone, bar maybe a sheep or two and it would sort itself out easily. There would be no thatch, compaction or LDP either. But we don’t have that luxury so we need to intervene to get our green in the shape we want, especially if our green has been subjected to what has become conventional or traditional greenkeeping. 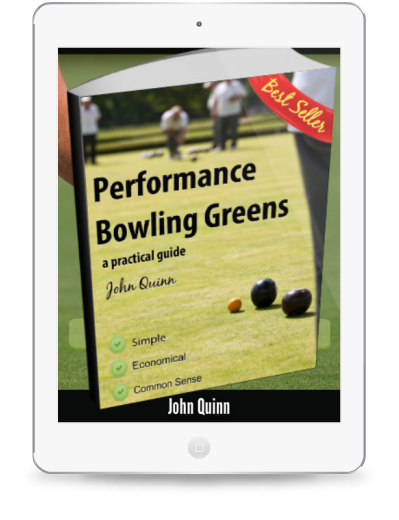 The transition from a failing green that is deep in the grip of the Circle of Decline to the Nirvana that is a Performance Bowling Green is something that needs a fair deal of skill and a great deal of patience and consistency of approach. Once we are in utopia with a Performance Bowling Green we can start to think of backing off on the heavy, physical maintenance and begin to implement a low disturbance diet. Once we have reversed the process of decline the bowling green can and will improve quickly, but it’s at this time that we need to exercise caution and stick with the program, avoiding slipping back into the old patterns of maintenance at all costs. At that stage we can start to use the stresses of disturbance to our advantage. 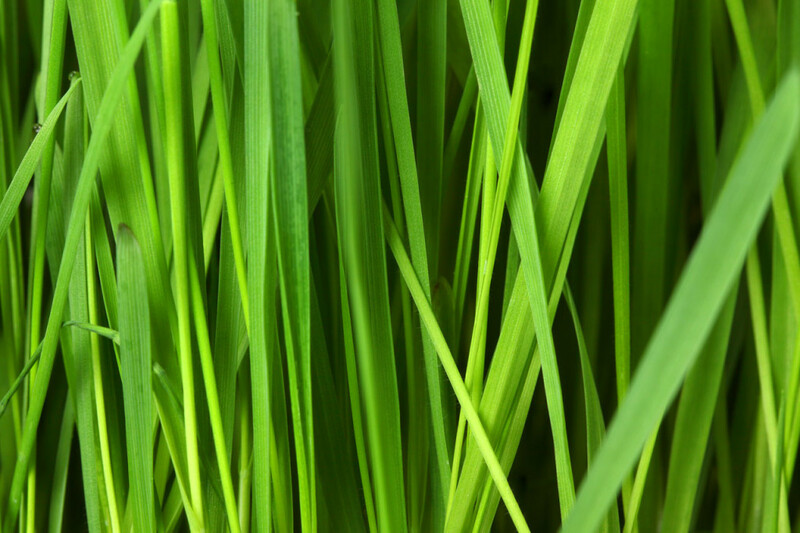 The plan is to create a healthy, settled green first and then put the thumb screws on the undesirables like annual meadow grass slowly but surely, all the time making sure that the techniques and intensity of maintenance we use don”t put the bent and fescue component of the sward under undue stress. Disturbance can be used to get the ball rolling on green transition from 100% annual meadow-grass turf with squidgy, thick thatch at the turf base over a claggy clay soil. The first steps would include making sure there is physical drainage to take away excess water. The program would then move on to the renovation phase which would start with aggressive compaction relief. Then a series of operations to physically remove thatch would follow and this could include, intensive core aeration, deep slotting/scarification and maybe even top dressing with sand (yes you read that correctly) if the conditions demanded it. 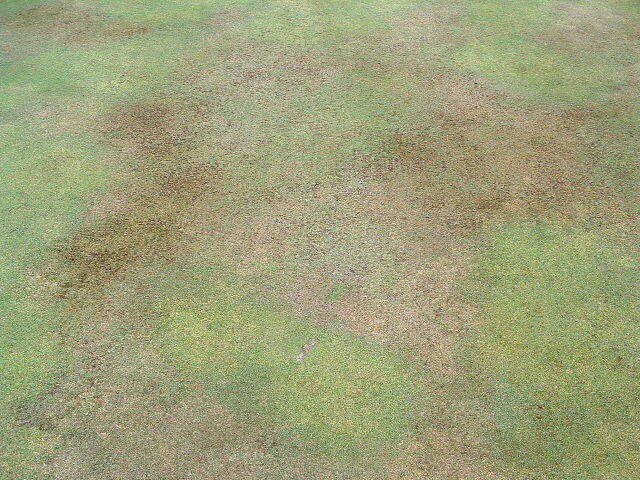 When in the grip of the Circle of Decline, greens in this condition usually need a high Nitrogen input just to tease a result out of them for play, so the fertiliser program will definitely need a revisit to reduce this. Watering will usually be too high also so we have to tweak and jiggle the program a little at a time in order to maintain grass cover during this major transition. 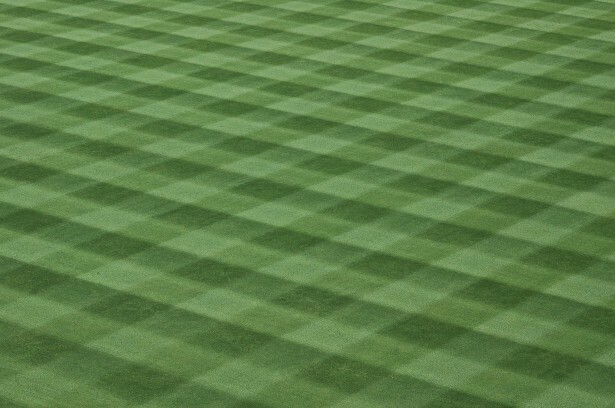 Finer surface aeration like verti-cutting will be intensified as will sarrell rollling and it will become increasingly important to keep the mower razor sharp with zero contact blade settings to maintain the health of the turf plants. In 1988, Grime, Hodgson and Hunt published their study called “Comparative Plant Ecology – A functional approach to common British species”, which on the face of it sounds like ideal bed time reading for insomniacs. However, the work these scientists carried out might make you sit up in bed and take notice when you realise how relevant it could be to the performance of your bowling green. 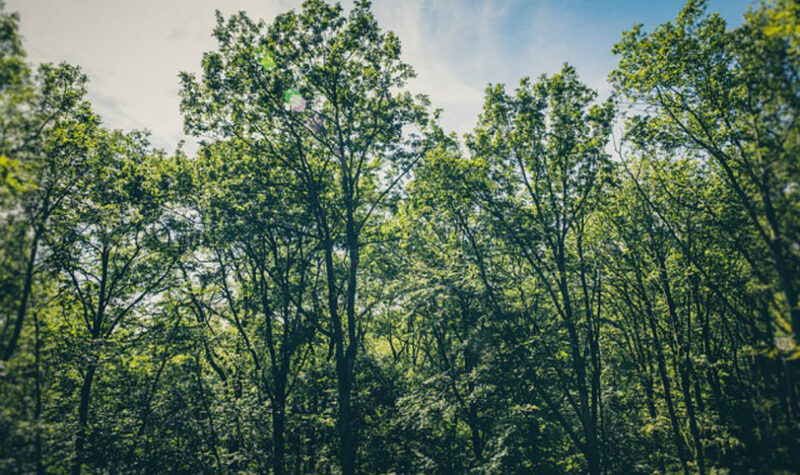 In this work, the authors state that vegetation that develops in a place at a particular time is governed by environmental pressures. These pressures may be categorised as stress, disturbance and competition (S, R and C) and that these vary in their relative intensities. Individual species develop their own growth strategies in order to deal with their own environmental pressures. Soil microorganisms exist in vast numbers in the soil as long as there is a carbon source to provide them with energy. The microbial population is made up of 6 distinct groups of organisms. In order of average population size (biggest first) there are Bacteria, Actinomycetes, Fungi, Algae, Protozoa and Nematodes. The actual biomass of each of these organisms can be confusing at first due to the difference in size of the individuals. 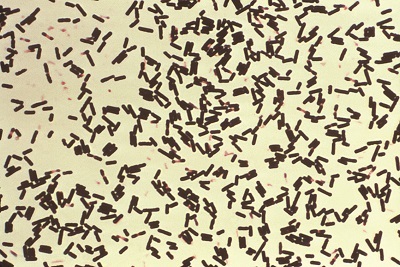 For example, due to their small size, Bacteria contribute a smaller overall biomass than Actinomycetes, even though these organisms are a factor of 10 times smaller in number. Due to these Actinomycetes being larger as individuals they contribute a similar biomass to the much more abundant Bacteria. Fungus population numbers tend to be smaller but are usually the dominant presence in the microbial biomass where the soil is left undisturbed. Bacteria, Actinomycetes and Protozoa are hardier making them more able to tolerate disturbance of the soil than fungal populations. Bowling greens are probably a half way house; not being subjected to excessive tillage, but not entirely undisturbed either. There are more microbes in a teaspoon of soil than there are people on the earth! The Circle of Decline is largely predicated on poor soil microbial populations due to inappropriate maintenance practices. Soil microbes are abundant in the soil and are vital to the recycling of organic matter in the soil to provide nutrition for plants. The smallest and most hardy of these are the Bacteria which can survive under the harshest of conditions and are especially resistant to tillage or the mechanical cultivation of the soil as happens in the top 100-150mm of the bowling green through aeration practices. Fungi are more specialised and need a constant food source meaning that they survive and thrive more readily in uncultivated soils. Soil organic matter consists of a mix of living microorganisms, dead leaves, shoots and roots (fresh residues), and the older decomposed plant material called humus. Fresh plant or animal material provides an ideal food source for microbes and is composed of easily digested sugars and proteins. Soil cultivation through aeration (incorporating oxygen) destroys soil organic matter through oxidation and allows bacteria and other microbes to rapidly decompose organic residues. Warmer soil and the presence of moisture speeds up this process by supporting an increased microbial populations in the soil. Organic matter with a low carbon to nitrogen (C:N) ratio (green material) is easily decomposed and nutrients are quickly released (4 to 8 weeks), while organic matter with a high C:N ratio (woody material like roots, rhizomes and stolons) decomposes more slowly and the microbes will tie up soil nitrogen to decompose the residues. Protozoa and nematodes consume other microbes in the soil and release the nitrogen as ammonia, which becomes available to other microorganisms or is absorbed by plant roots. Biotic and abiotic factors interact with each other. For example low oxygen levels in turf (abiotic) will affect the health of the turf roots directly when the soil becomes increasingly acidic making it harder for roots to extract nutrients from the soil, and indirectly by reducing the population of beneficial bacteria (biotic factors) which play a role in breaking down organic material to release nutrition. Some of the key factors that benefit or hinder a species in its quest for dominance are described as Environmental Stresses. It is these stresses that drive the evolutionary process and as such can be used by the bowling greenkeeper to create conditions that are more suitable for the desired species than for others. 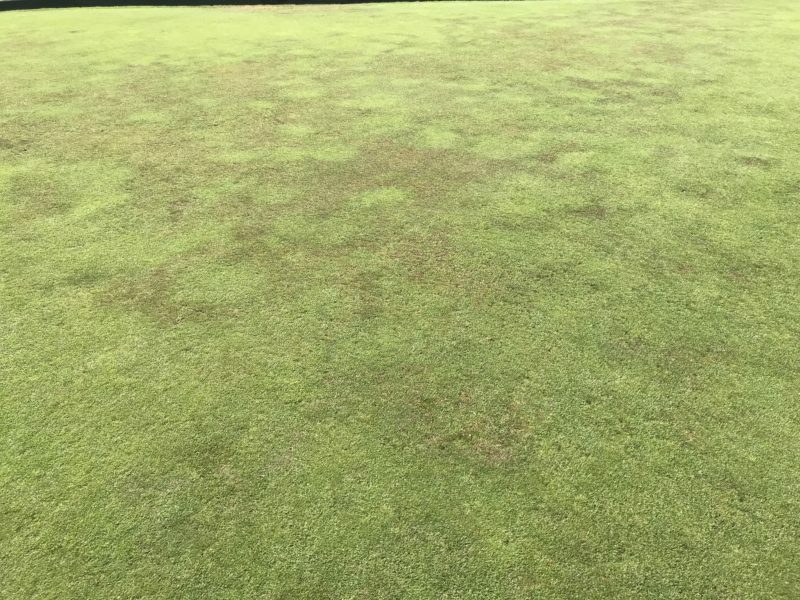 There are a number of ways for greenkeepers to manipulate the environment artificially, or indeed to take advantage of naturally occurring stresses, in order to alter the balance of the bowling green ecosystem in favour of the desired grass species. An understanding of Competition and Adaptation in eco systems will help you a great deal in developing a sound greenkeeping program for fine, perennial grasses. However we choose to interact with this bowling green ecosystem (with or against nature) we will be working within a dynamic, constantly changing environment and it is vital that we understand this before stepping off into a new program of maintenance. In other words we need to think of our green as an eco-system. Getting to grips with some universal ecological terms will be useful. 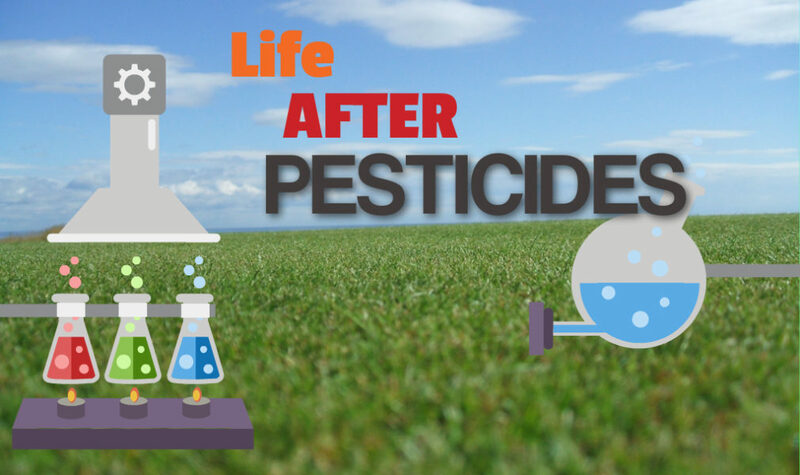 Chemicals can affect the soil and the micro-organisms contained within it. Of course, in some cases this is exactly the effect that is required. 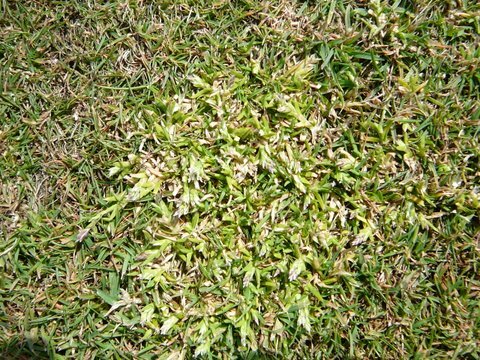 Fungal pathogens such as those responsible for Fusarium disease in turf are micro-organisms and we might think, that logically, it's a good idea to be rid of these. 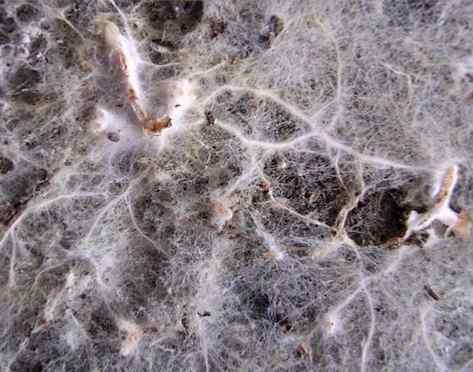 Mycorrhizal Fungi; an argument against fungicides. Today I want to get a little bit deeper into the science of bowling green ecology, but I’m getting a little tired of the Ecology title sequence I stupidly started 9 articles ago. Instead of continuing to label them Ecology 1,2,3…etc, I will give them a tag of their own so that if you’re looking for them on the site you just need to type ecology into the search box. Mycorrhizal Fungi (mycorrhizae) are specialised fungi that work with our grass plants to form symbiotic relationships with the roots. Most soils contain these fungi and each type has its own peculiar host preference. (i.e., each plant species has a specific species of mycorrhizae that it prefers to work with). The name comes from the Latin word mycor meaning fungus and rhiza meaning root. “Mycorrhiza” is the singular form and “mycorrhizae” the plural and, in soil science the name refers to the tissue that forms when fungi and roots develop a symbiotic (mutually beneficial) relationship.